Thousands of victims are sleeping in shelters after the earthquake of 7.1 degrees on the Richter scale that shook Mexico on Tuesday and has so far claimed the lives of 237 people. The earthquake, whose epicenter was the boundary between the states of Puebla and Morelos, was also felt in Philadelphia. Thousands of Mexican immigrants living in the south of the city come from the region where the earthquake occurred. With this in mind, the Consulate of Mexico in Philadelphia called on the citizens of the Latin American country who want to help their countrymen across the border, taking into account certain precautions. "We are pushing people to donate through institutional means such as the Mexican Red Cross, which has a secure and simple website through which donations can be made with a credit card or PayPal," said Carlos Torres, Consul of Press and Promotion. 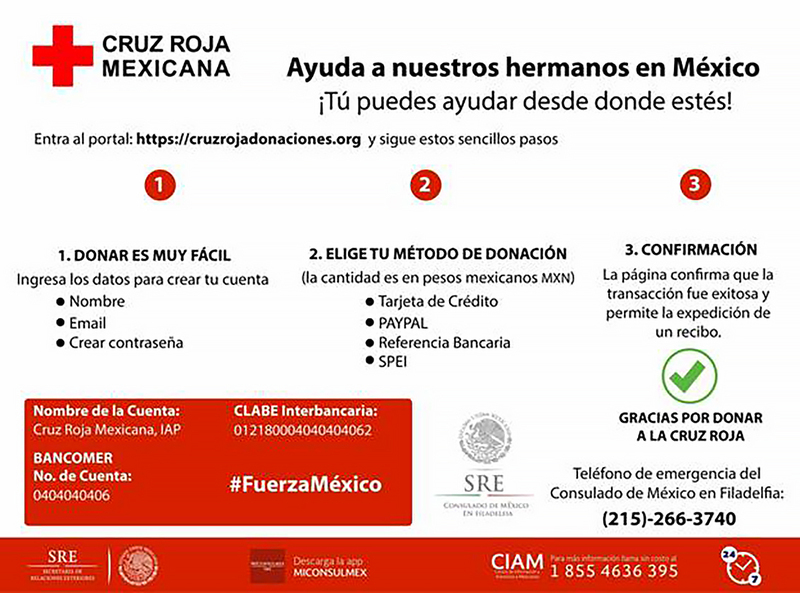 In addition to the Red Cross, those who want to donate can also do so directly on Los Topo’s website - the Mexican rescuers civil service - and Unicef ​​Mexico. For the spokesperson of the Consulate, it is important that the community also take into account the type of help that is needed at the moment. "It is not that the country doesn’t have food or resources. What Mexico needs at the moment is money to help expedite humanitarian work," he said. The official celebrated the initiative of some members of the community in South Philadelphia to start collecting items to help, however he invited his compatriots to report well before sending anything. "Sometimes the eagerness to contribute can end up hampering the help when sending things that are not needed." He stressed that for now, the most urgent thing is to donate monetary resources through reliable sources to support the work of rescue and care of victims. Torres also recalled that the doors of the Consulate are open to all people who have been affected or need help to locate a relative in Mexico.